A cohousing community is a type of intentional community composed of private homes supplemented by shared facilities. The community is planned, owned and managed by the residents – who also share activities which may include cooking, dining, child care, gardening, and governance of the community. Common facilities may include a kitchen, dining room, laundry, child care facilities, offices, internet access, guest rooms, and recreational features. Cohousing facilitates interaction among neighbors for social and practical benefits, economic and environmental benefits. Would this be the first such development in Victoria? And I guess it differs from a co-op in that people own their units. There was something down in Fairfield like this, 15 years ago. The best way to refer to co-housing is a cross between a housing coop and a condo with a strong set of politics as part of your lifestyle. With the kind of people that would choose this lifestyle, don't we assume that they would share their cars too? Looks like a lot of costly infrastructure. What are the projected strata/management fees I wonder? Shared laundry? Agree with Bernard about the cars. People can't live without their cars, even hippies. What was the outcome of that Fairfield experiment? What was the outcome of that Fairfield experiment? It didn't work and it converted to standard strata housing. Cardiff Place on Fairfield Rd just West of Moss St. It started as a cohousing community but was apparently not sustainable. What's our divorce rate? Somewhere around 40% for first marriages. Now look at 30 families trying to live together, that's gotta be way worse odds than a rock band staying together. Yup, from time to time you might get a Rolling Stones, but more often than not, you're looking at Nirvana. Co-housing only works when it's more or less the only option, or forced. The military, work camps in the far north or oil-patch, Western compounds in Saudi Arabia, places like Our Place, prison. 99.9% of the population would never buy into one of these situations, and that's what co-housing is asking you to do. Why let the real world influence your thinking? Good for them that they can dream. Not so good for them when it comes to actually living with those dreams. Not too many "communes" actually exist for the most basic reason of all - human nature. On a practical note - who the heck would finance the construction and ultimate pruchases of something like this? The plans for the development in fernwood seem to require too much involvement from the developer too early in the process. Way back when, I tried my hand at resi real estate and showed a house in fernwood that from the street appeared normal. In the rear though, the property, along with 4-5 other properties all abutting each other in the rear yards, was one "vast" open field and all the families used it as a gathering place/playing field/natural green oasis. My keen jerk was who the hell wants to share a back yard with your neighbour, but this unorganized situation had been existing for over 20 years. Sometimes maybe "co-op" communities have to be allowed to grow on their own with the fundamentals in place rather than extensively planned. Thousands of houses/townhouses in England were built around central gardens only accessible by the home owners and they are considered very desirable to be in to this day. I know friends that live in co-housing in the lower mainland. It is requires a huge commitment in being involved with building the community. The problem becomes when you want to/need to leave. Divorce is an issue. It is not automatically open for anyone to move in. If people want to do co-housing, go for it, but this specific development does not seem like the best design for this site. As to to the parking, the work done to determine that 13 spaces would be enough was spurious at best. It made assumptions about the area with little evidence to back them up. Not too many "communes" actually exist for the most basic reason of all - human nature. And I think that's right. I don't see see all the upside here. Is this much more inexpensive than regular housing? Probably not. So if you desire this type of community, you can still buy your own home, and get involved in your local community garden, rec centre, clubs etc., AND when you want privacy or a time-out, that's easy. It is not automatically open for anyone to move in. Do prospective residents need approval? 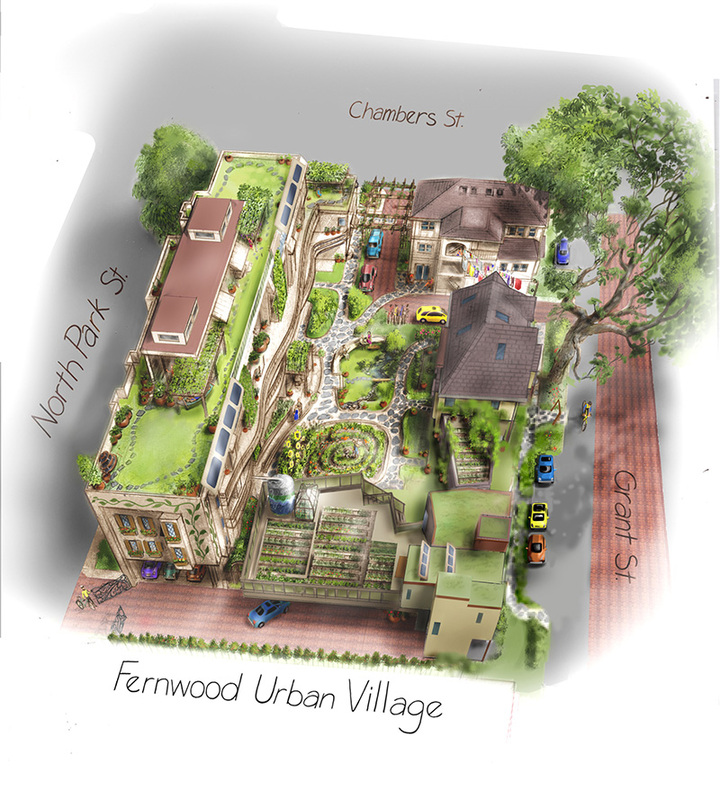 I didn't see mention of that on the Fernwood Village web site. Possibly. New York City's exclusive co-ops are famous for brutal reviews by the board to determine a prospective owner's suitability. The Dakota board over the years has rejected Melanie Griffith, Antonio Banderas, Gene Simmons, Billy Joel, and Carly Simon. This will take a lot of work to sustain. While lots of people dream of living in the Dakota, this will be a tougher sell. In some ways, it's the worst of both worlds, the worst of living with roommates combined with the expense and hassle of owning a home or condo. With co-housing the goal is a community of people that fit with each other. Normally the people that want to live in co-housing tend to self select, but ultimately it is up the the community who lives there and who does not. ^Now, if we could only do that in every neighbourhood.